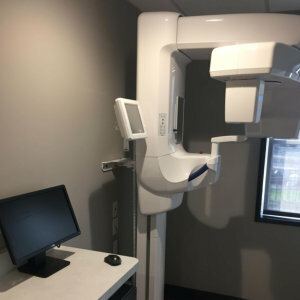 Bergen Premiere Dentistry is one of the few dental practices in Ramsey, NJ to provide cone beam CT scan in the office for more accurate and detailed diagnostic. This also means convenience and less wait time for our patients as most dental practices send their patients to an external imaging center. Cone Beam CT Scan is a state-of-the-art scanning equipment we use to produce 3D images of our patient’s teeth, mouth, bone, soft tissues and nerves in a single scan. The images allow our dentists to detect and accurately measure key anatomical or dental structures such as the exact position of teeth, nerves, sinuses and more. At Bergen Premiere Dentistry, we strongly believe that accurate diagnostic can lead to better planning and deliver predictable treatment results. Using the cone beam CT scans can also significantly reduce the time it takes to perform dental implant procedure. Cone Beam CT Scan is quick, convenient and easy to do. During the scan, you will be asked to sit still on a designated sea, while the machine takes hundreds of pictures of your face. These pictures are assembled into a three-dimensional image of the inner mechanisms of your face, mouth and jaw. It will allow your dentist at Bergen Premiere Dentistry to zoom in on specific areas and view them from different angles. Cone Beam CT Scan involves a lot less radiation compared to traditional dental X-rays and can be performed in less than 30 seconds. Cone Beam CT scans are highly beneficial because they allow our dentist to magnify certain areas of the face. It also allows our dentists to clearly see cross-sectional views of the jaw, which makes planning and treatment more accurate, simpler and quicker. With highly-experienced and caring dental team, convenient location and office hours, Bergen Premiere Dentistry is the dental practice to turn to if you’re looking for a dependable dental care in Ramsey, NJ. Call (201) 746-4614 today for more information or to schedule your appointment.